When I was growing up, my mother never made cream cheese-based cheesecakes as she found them too rich and cloying. Instead, she preferred those made with ricotta, which lends them a tender lightness. My recreation of the ricotta cheesecake she makes incorporates rum-soaked raisins in the batter and uses a basic shortbread for the crust. The cake is fluffy but moist, and gently crumbles when chewed without sticking to the roof of the mouth. Great served room temperature or warm, it makes a wonderfully light dessert perfect for warmer weather. If you’re not a fan of raisins, they can easily be omitted or replaced with fresh berries. 3 quarts whole milk (if using low-fat milk, which is not recommended due to a drier and grainier texture, use 1 gallon). The yield should be 20oz of ricotta. 1. 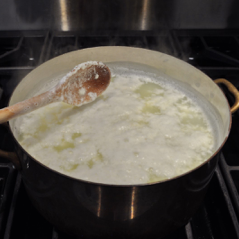 In a large, heavy-bottomed pot, heat the milk until it is barely simmering. Tiny bubbles or foam should appear on the edges and the milk should steam. Pour in the lemon juice and stir. 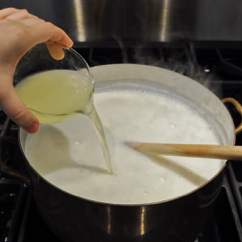 The milk will curdle, and small white curds will separate from the yellowish whey. Let the mixture sit for about 30 seconds, then pour into a strainer over a large pot. 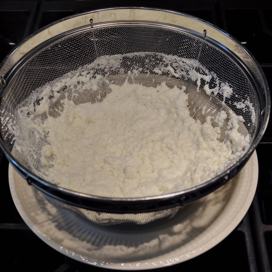 If the curds have broken up and many small pieces go through the strainer, line it with cheesecloth or a double layer of paper towels and strain again. 2. Let the ricotta cool, and reserve for cheesecake filling. 3. Preheat the oven to 325ºF. In a small bowl, combine the raisins, orange juice and rum. Let the raisins soak for at least 30 minutes-- the longer the better. If the raisins do not appear to be absorbing the liquid, gently heat them in a small saucepan or in the microwave so that the liquid is warm. They should be soft and plump when finished soaking. 4. To make the crust, cream together the butter and sugar until light and fluffy. Beat in the egg yolk, vanilla, and salt. Add the flour and mix until the dough has just combined. It will be very soft and wet. 5. Press the dough into the bottom of a 9 inch springform pan, buttered and lined with parchment paper. Bake for 25-30 minutes until the crust is golden brown. Remove from the oven and let cool while preparing the filling. 6. Add half of the sugar to the yolks, along with the vanilla and cinnamon. Beat until the mixture is extremely light and a pale yellow color. Add 20 oz of ricotta and stir to combine. 7. 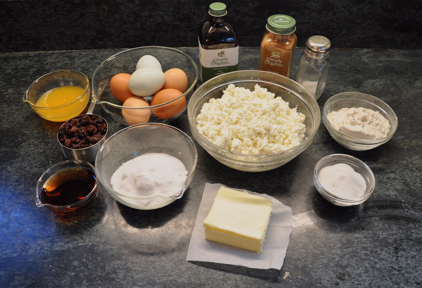 Transfer the yolk mixture to a blender or food processor and blend until the pieces of ricotta are very small and the mixture appears slightly grainy. This allows for a lighter and more tender cake, as the cheese is more evenly-dispersed throughout the batter. Transfer to a large bowl. 8. Beat the egg whites until they become foamy, then add the remaining half of the sugar. Whip until stiff peaks form. 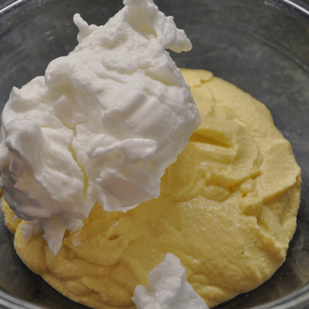 In two additions, fold the egg whites into the egg yolk mixture, retaining as much air as possible. Drain the raisins, and fold them into the batter. 9. Evenly spoon the batter into the springform pan, and smooth the top with a spatula. Bake in the center of the preheated 325ºF oven for approximately 80 minutes, or until the cake barely wobbles in the center when moved and is a dark golden brown. 10. Let cool in pan for 15-30 minutes. The cake will deflate and pull away from the sides of the pan. Run a knife around the sides of the pan and remove the cake. The cake can be chilled, or eaten warm. If desired, it is lovely topped with a dollop of crème fraiche mixed with a splash of dark rum or vanilla extract. This cheesecake keeps very well in the fridge for up to a week in an airtight container. If you don’t like raisins, this cheesecake can be made with berries and flavored with lemon. Rub the zest of one lemon into the sugar (for the batter) until it becomes sandy in texture, then use as directed in the recipe. Berries such as blueberries, raspberries, and blackberries can be arranged on the crust, and then covered evenly with the batter before baking. You don’t need to make the ricotta yourself, though it is quite easy and saves money! Store-bought ricotta is fine-- just measure and use 20 oz directly.